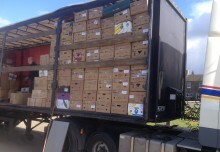 Chernobyl Aid UK > News > Another delivery of happiness to Belarus. 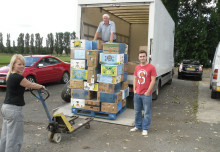 On October 23rd two trucks and over 10 tonnes of aid left the Hull docks on route for Belarus. Alan Wade, Bob Beech and Mick Riley, all from Stockton on Tees. were accompanied by Mike Allison from Hillam, Yorkshire. Alan and Bob’s vehicle was displaying it’s new livery with our logo and colour, something we were all pleased to see and are very proud of. The plan is to similarly sign the smaller truck within the next two months and certainly before the Spring convoy. The journey to Belarus was not too much of a challenge apart from serious traffic delays in Germany (three hours lost there) and a ‘lock in’ at the Polish customs (another three long hours lost) but we arrived at the Zhlobyn customs in the centre of the country after three days of travel. Once cleared we made delivered to the Rogachev Association for families with disabled children. The title is an accurate description of their role which they have undertaken for over 20 years. Receiving no help from their authorities the charity brings together parents and children to share general and common problems. It is disappointing that were previously they had several rooms in their centre they now have just two which includes the office! We saw an art class where youngsters with learning difficulties were being instructed in working with Plasticine to produce pictures and we were all given art work previously produced. Our aid was a wide range of basic items and included almost three tonnes of incontinent pads that the charity were instructed to share with two local institutions, Zhuravichi and Vikov, that cater for the physically and mentally disabled youngsters and adults. Also we were carrying a massive donation, 450 kg, of sheet music and instruments specifically for the Rogachev School of Music who will share with other schools. We enjoyed a meal and discussion with the committee who stressed just how much they depend on the support from the UK as they, their families, spend most of their money on medicines for their sick children with very little left for basic items such as clothing and particularly footwear. So we are appealing for such items along with soap, toothpaste and brushes for our next convoy. Next day we arrived at the Gomel customs with the second vehicle and then unloaded at The Gomel Diabetic Association another similar independent charity receiving no support from their authorities and relying on charity both from in Belarus and elsewhere. Our load was 2.5 tonnes of clothing, footwear, toiletries , incontinent pads etc packed and collected from our group in Longnor near Buxton in Derbyshire. The association has over 750 diabetics, children and adults, who each receive just $120 per month for their medical needs and again, as with the Rogachev charity they appeal for the basics they find hard to afford once additional much needed medical items have been purchased. We had another splendid meal once the unloading process was complete and learned in discussion that the number of diabetic cases in the city of Gomel far outstripped that of other areas and that those affected, in many cases, become further inflicted with cancers. The declaration was made after we asked what influence the explosion at Chernobyl had made to the number of diabetic cases and was it still relevant after almost 39 years. We were well encouraged by the reception and information we had from both of these receivers and plan to make further deliveries next year. We had a meeting and meal with Liena Fedorchuk. our team member in Gomel. who is the link between our UK operation and all out receivers in Belarus and then headed for the return journey across Europe and home. This convoy like so many in the past and, no doubt, those in the future is down to the work of so many people who give their time and effort free of charge to collect the aid, load the vehicles, raise funds, supply the aid etc. In all a remarkable team effort. Shortly we will have completed the loading of the large trailer which hopefully will make the journey to Belarus with a massive load for the Gomel Regional Education department that is opening adventure camps for children. The load includes many items such as beds, chairs and tables, pots and pans, etc supplied by Ikea and soap powders, school equipment for learning and sports. It includes household paint supplied by Whittles Programmed Paint along with other aid that will make a real difference to what they are able to achieve for the children.